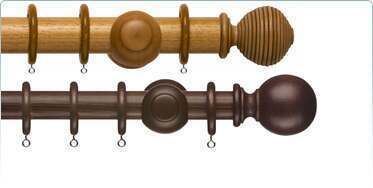 Welcome to our hand-picked collection of wooden curtain poles. These popular poles can be decorative or demur, finished in a variety of natural stains ranging from light to dark woods, or painted in a wonderful array of colour palettes. Most wooden poles from our collection are manufactured from wood grown in environmentally friendly managed and sustained forests. The versatility of wood means it has many other uses in our home interiors and therefore lends itself for the colouring to be complimentary to other wooden design details in the room. 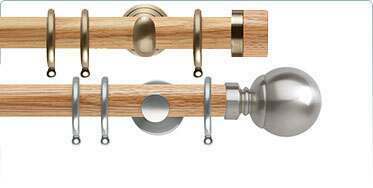 In our range of stained wooden curtain poles you will find a choice of wooden poles finished in natural wood stains. These poles have been treated in traditional wood stain colours to give the effect of different timbers. Please srcoll down to browse our most popular wooden pole stains. 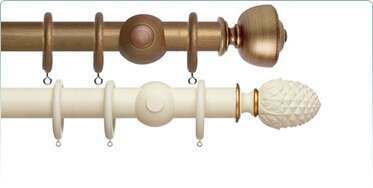 This collection of painted & special finish curtain poles include colours such as white, black, silver, gold, gilt and many more. All these products are supplied as complete sets which include brackets, curtain rings, finials, fittings and fixing instructions. All information including delivery times and amounts of brackets and rings supplied with each length can be found on each individual product page. Our poles are available in extra long lengths of up to 6 metres and in diameters ranging from 28mm (1 1/4") for lighter weight curtain fabrics and up to and including 65mm (2 9/16") for heavy curtains. For standard medium to heavy weights we recommend a diameter of 35mm (1 3/8") or above, all easy to fit and can be trimmed to length at home using a fine tooth saw. The same pole presented in different colours of wood stains and paint effects can make a huge difference to the impression a pole makes in a room. To highlight this phenomena we have arranged multiple images of the SAME popular wooden pole presented in different stains, tones and paint effects. It is clear from these photographs that choosing the style and colour of a pole is something that should be carefully considered. Are you looking for a lively, bright pole, something of a feature itself, or would you prefer a pole that fades in to the background, permitting the curtains to take centre stage.